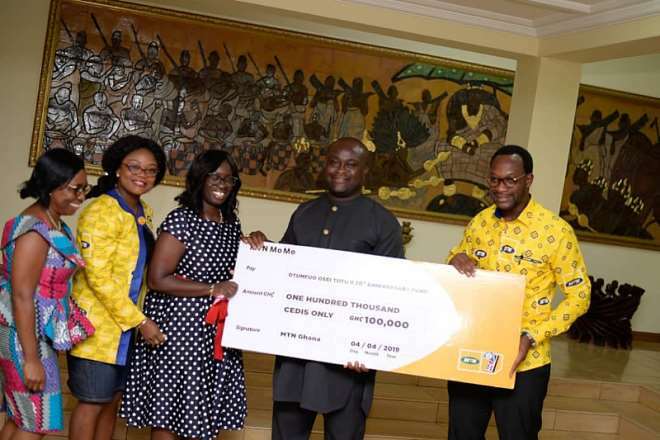 Mobile Telecommunication giant, MTN led by its Chief Executive Officer (CEO) Mr. Selorm Adadevoh has donated a cheque of GHC 100,000 with a hamper cost of GHC 5000 to Asantehene, Otumfuo Osei Tutu 11 as part of their contributions towards his 20th Anniversary Celebration. Addressing the media after the presentation, Mr. Mr Selorm Adadevoh noted that they had come to commend him for the good works he is doing for Asante and Ghana. 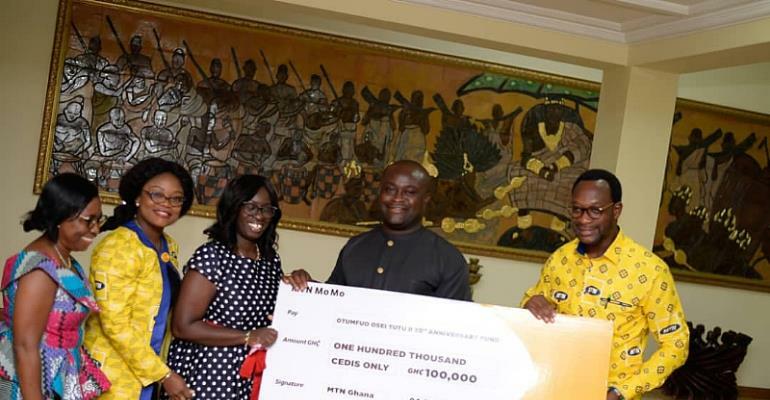 Asante kingdom, he said, has been very instrumental in MTN leadership in the mobile telecommunication business in this country hence, the donation to the Asante Monarch in his 20th anniversary for his immense support. “The Asante Monarch has contributed immensely to our success and as part of our social responsibilities, we are here to show our appreciation to him for the nice reception he has given MTN in his kingdom in his 20th anniversary”. He stated. 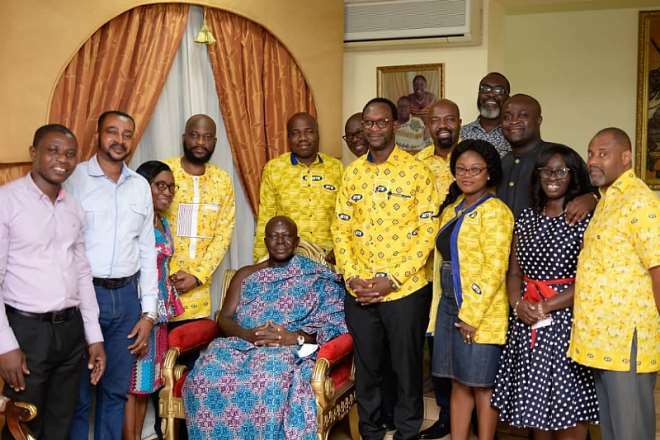 In an interview with Louis Gyamerah at the Manhyia Palace the CEO Selorm Adadevoh disclosed that MTN has partnered with Asantehene on so many projects such as provision of internet facilities in some communities in Ashanti region. Adding that, they have also sponsored Kumasi Asante Kotoko Football Club and have even renovated the team’s training pitch at the cost of GHC 540,000 and there are several activities that will be roll on as far as the Otumfour 20thAnniversary is concerned. 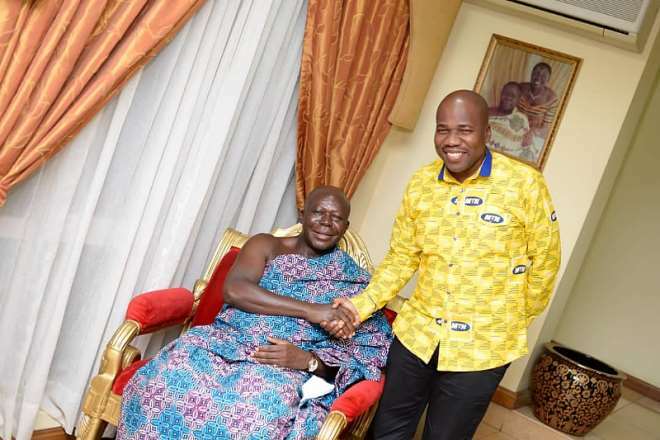 The 20th-anniversary celebrations of the enstoolment of the Asantehene, Otumfuo Osei Tutu II on the Golden Stool at the palace in Kumasi officially started on March 9 and ends on May 22, 2019 and the climax fixed for April 21, with a grand durbar at the forecourt of Manhyia Palace. Known in private life as Barima Kwaku Duah, Otumfuo Osei Tutu II ascended the Golden Stool in April 26, 1999, as the 16th occupant, succeeding his brother Otumfuo Opoku Ware II who visited his ancestors on February 25, 1999. The celebration also include the banning of funerals in the Asanteman traditional areas from April 8 to 29, which according to them, should be observed as such to avoid punishment. Some of activities including performance of Nsuman Agro by Otumfuo on Monday, April 1, and Asanteman Queen Mothers’ Day on Wednesday, April 10. President Nana Addo Dankwa Akufo-Addo will be the special guest of honour on Akwasidae Kese on April 21, 2019, which is the grand durbar at the forecourt of Manhyia Palace. Others are video/photo exhibition on twenty (20) Years of Otumfuo’s reign on Monday, April 15, and unveiling of Otumfuo’s statue at the newly constructed Kejetia Redevelopment Project and the sod cutting for Central Market Redevelopment Project - Phase Two on Thursday, May 2. The Chief of Staff of the Asantehene, Mr Kofi Badu, dsiclosed this to journalists in the first of a series of media encounters at the Manhyia palace in Kumasi.